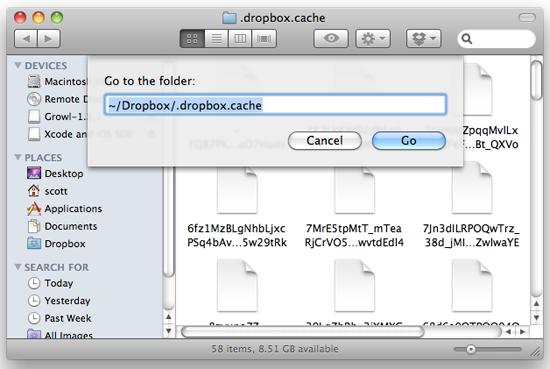 The Dropbox cache is a hidden folder named ".dropbox.cache" that is stored in your root Dropbox folder. You will not see this folder unless the ability to view hidden files and folders is enabled in your operating system. If you deleted a large number of files from your Dropbox, but your computer’s hard drive does not reflect these deletions, the files you deleted may be held in the cache folder. Dropbox keeps a cache of files for efficiency and emergency purposes. It is also used as a staging area for downloading and uploading files. How do I clear the Dropbox cache folder? Your cache folder is automatically cleared every three days. If you need to delete sensitive files immediately, or you need to clear up some space on your hard drive, you can manually clear the cache with the below steps. Delete the files in your cache by dragging them out of the Dropbox cache folder and into your Trash. Open a new Windows Explorer window by clicking on the Start menu and then My Computer. This will take you directly to the Dropbox cache folder in your Application Data folder. Delete the files in your cache by dragging them out of the Dropbox cache folder and into your Windows Recycle bin.